We offer you to download Minecraft PE 1.2.16 for iOS full version for iPhone and iPad. The developers of the company Mojang worked hard for the next release and created many new features, changes, in this version of the game and we will tell you about everything interesting that you can see in MCPE 1.2.16. The gameplay becomes more stable, as the developers were able to stabilize the gameplay. So, let's check! 1. 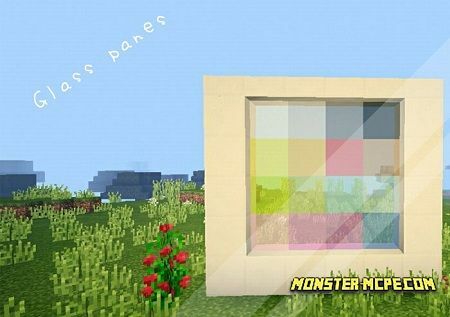 Stained Glass is a new item that you can use when creating a home or other structures. This object is quite beautiful and can be of different colors. 2. Fireworks is your ability to create holidays in such a way as in real life, add brightness for memorable events in the game! 3. Parrots are new creatures of different colors. They will perfectly decorate the game universe of Minecraft PE. 4. Banners will be useful when decorating different buildings or your home in the game world. 5. Armor stand is used to install your armor on it. A great way to store armor in sight. 6. Jukebox with CDs will add music to Minecraft for iOS, CDs contain different music for every taste. 9. Ravines is a new place, where you can search for minerals.